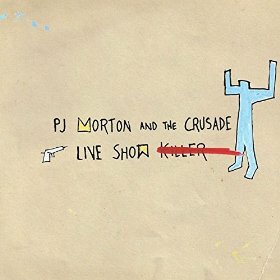 PJ Morton opted for an intimate venue of the Jim Henson Studios in Los Angeles for a live performance before a group of friends and industry insiders that became the CD and DVD, The Live Show Killer. Morton, who, when he is not cutting classic albums such as 2013’s New Orleans, plays keyboards for Maroon 5, directed resources to his crack band - The Crusade. That outfit features a couple of guitarists, a horn section, and what amounts to a chamber quartet – two violins, a viola and cello. Morton also got cameos from R&B A-listers Mali Music and Tweet. Mali Music sings the part that Maroon 5 front man Adam Levine on rock infused cut “Heavy.” Tweet reprises her duet with Morton of the Caribbean rhythm number “Love You More,” a tune featured on 2010s Walk Alone. The result is a treat for the fans who saw the show live and in person, as well as those who viewed it via Periscope, and that treat will now be afforded to those who get a copy of the CD/DVD. The full and lush sound created with the backing of such a high quality band gives the concert something that often in short supply at live R&B shows - unless you’re going to see a legacy act such as Maze, Earth, Wind & Fire or P-Funk, or contemporary performers such as D’Angelo or Avery*Sunshine who have strong connections to classic soul or gospel. Along with Morton, who got his early training the church of his father, Bishop Paul S. Morton, Sr., the Crusade is a band that is capable of drawing from the full palate of black music, including blues, gospel, jazz, funk and rock. The show mainly features Morton compositions, and the artist clearly had the talent on stage to do a sweeping rendition of ““How We Were, Pts. 1 & 2” that featured a short, brassy and powerful homage to Otis Redding’s “Try a Little Tenderness,” as well as a sweeping participatory call-and-response segment reminiscent of something James Brown and Bobby Byrd might have done back in the day. Morton, despite a short and pretty successful stint on a label that coincided with the release of New Orleans, has the heart of an indie performer, and that includes a commitment to a hard driving, virtuosic and fun show, because unsigned artists know that live performances serve as their primary introduction to an audience. Of course, Morton knew most, if not all, of the people in that room, but he likely drew energy from performing in front of a friends primed to offer their support. The Live Show Killer will mostly find its way into the hands of Morton fans who go all the way back to Emotions or at least signed on with Walk Alone. However, The Live Show Killer contains surprises for long-time fans, such as the aforementioned “How We Were,” but especially the performance on “Good Days, Bad Days,” which is the best example of what is evident throughout this live set – Morton’s ability to draw from all of his influences and to bring the best out of his band. The portion about two thirds through the song when Morton and Josiah “Jo Jo” Martin alternate with a vocal riff on the line “they don’t change who we” comes straight from Baptist church, as does Morton’s keyboard playing. The horns recall the glory days of Stax records while the bass line is straight Chicago blues. Fans learned the deep admiration that Morton has for Stevie Wonder on “Only One,” which is another high point on The Live Show Killer with Mike Burton’s tenor sax solo replacing Stevie’s harmonica, and Morton’s vocals will remind many of Wonder. Recordings of live shows can be a risky proposition for the same reason that attending a live concert can be a caveat emptor experience. Many of the tricks and technologies that allow producers to hide an artist’s weaknesses are not available at live shows, and live shows make it hard to conceal the fact that a performer is not on his or her A game. But even if none of those problems are issues, audio recordings of live shows often make it difficult for the listener to capture the dynamic of the connection between performer and audience, as well the communication that takes place among the band members. Thankfully, the audio recording is of a high enough quality that listeners can hear the crowd respond and participate, and the DVD is an addition that provides visual confirmation of the qualities Morton fans have long known that he possess – creativity, deep talent, an engaging personality and passion for entertaining. Highly Recommended.